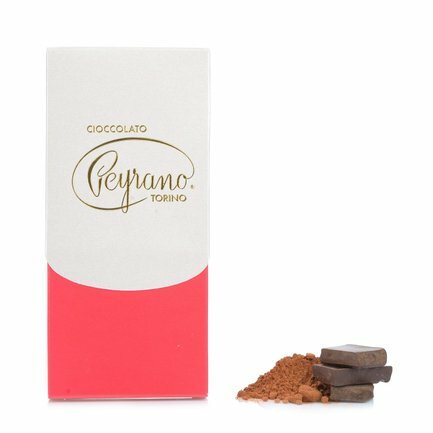 This 51% Dark Chocolate Bar is the result of Peyrano's hallmark research and painstaking selection of ingredients. On the palate the chocolate delivers nuances of Bourbon vanilla thanks to the use of the prized pods in the preparation, accompanied by a well-rounded flavour with moderate acid notes. Persistence of nose and palate is excellent. Perfect for a tasty snack any time of day, dark chocolate enjoyed in moderation has been shown to be functional for our health thanks to its ability to scavenge and destroy free radicals. Ingredients cocoa, sugar, cocoa butter, emulsifier: (soya) lecithin, Bourbon vanilla pods. May contain traces of milk or derivatives and nuts. For more information on product labels, please contact our Customer Service department. The information on the labels of the products may vary for reasons beyond our control, therefore, there may be discrepancies between the information on the site and that on the products delivered. Please always check the information on the product before consumption or use. Peyrano was founded in 1915 in Turin, when Antonio Peyrano decided to follow his passion for confectionery art by opening a small firm for processing of cocoa beans to create extra fine chocolate. Peyrano's family members also embarked on the production of baker's confections and fruit Gelées, and the firm's products soon started to attract an increasing number of devotees. Today the firm proceeds on its successful path thanks to the commitment and enthusiasm of the latest generations.